Watford’s Anthony Joshua (20-0, 20KO) retained his IBF and WBA world heavyweight titles with a tougher than expected 10th round stoppage of the game Carlos Takam (35-4-1, 27KO) at the Principality Stadium in Cardiff. It was Joshua’s first fight since an epic Fight of the Year contender and 11th round knockout against future Hall of Famer Wladimir Klitschko (64-5, 53KO) in front of 90,000 fans at Wembley Stadium in April. He had initially been set to defend his world titles against Bulgaria’s mandatory challenger Kubrat Pulev (25-1, 13KO), who was forced to withdraw due to a shoulder injury. 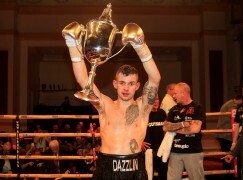 Take stepped in at 12 days notice, though promoter Eddie Hearn insisted he had been waiting as an insurance policy reserve for a number of weeks. Joshua was on the hunt from the opening bell, forcing Takam backwards – an unfamiliar position for the usually aggressive heavyweight. That reluctance to stick it on Joshua was largely down to the size difference. Joshua weighed in at a career heaviest of 18st 2lbs, almost two stone more than Takam. Staking behind a high guard, Joshua sent a few singles out as range finders in the opening round and it was enough to discourage Takam from any premature acts of bravery. An accidental head clash got juices flowing in the second round and after dapping at a sore and leaking nose, Joshua responded with spite. A wide left hook landed, sending Takam on his heels and Joshua hastily pursued. Nothing more of note landed in the rest of the round but first blood had been drawn, which naturally drew large cheers from the 78,000 capacity crowd. The third round was relatively uneventful as the pair stood tensely in mid range and the only shot of note was a left hook from Takam, though it didn’t encourage him to edge forward any further. Takam has never appeared to box on the back foot before and it certainly was a tactic that suited his natural instincts. However, he was successful in making Joshua fall short for the first minute of the fourth round until a four punch combination eventually found its target. Takam was dazed and even motioned to the referee that he had a problem with his right eye. Shortly after, an unsympathetic Joshua wasted no time in forcing the Frenchman to touch down with a thunderous short left hook. The bell sounded soon after, not that it stopped Joshua launching two more bombs. Now in his groove, Joshua didn’t waste any time with long range fencing, instead walking Takam down and among to dish out more punishment. It was interrupted by a doctor’s inspection to Takam’s injured eye, though quickly recommenced. By the halfway mark, Joshua became more patient and started to select his shots more, unclear whether he was taking time off or was suffering from a reoccurrence of his stamina issues. 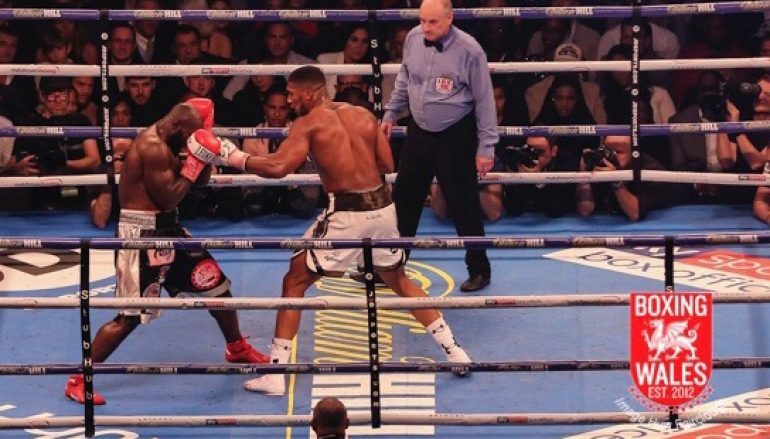 It afforded Takam room to come forward and when he did, a right cross-left hook counter signalled Joshua’s need to stay sharp. Despite now being cut over both eyes, Takam became more ambitious in the seventh round and committed to his shots, catching Joshua with repeated flush overhands as he grew with confidence. They seemed to stall Joshua’s energy and the reigning champion was happy to slow the pace down. Joshua spent most of the eighth round pushing forwards, though lacked the same energy and presence that he possessed earlier in the contest. The 28-year-old has learned a lot of lessons in a short amount of time, having started boxing just nine years ago and Takam was proving to be another sturdy hurdle to overcome. Two doctor’s inspected Takam’s cuts at the start of the ninth round, which seemed unnecessary considering it wasn’t affecting his unexpectedly sturdy performance. The late replacement would soon be undone by the officials, though. For the first time in a while, Joshua sustained a heavy attack in the 10th round, which Takam was trying to evade. Long before the natural conclusion, the referee jumped in to halt proceedings and extend Joshua’s 100% knockout ratio. The bout was officiated by Phil Edwards. The Bangor born official now resides in Preston but still became the first Welshman to referee a world heavyweight title fight.